Global Overshoot Day this year was on August 13. Every year the Global Footprint Network calculates the date “when humanity’s demand for ecological resources and services in a given year exceeds what Earth can regenerate in that year.” The Earth regenerates in the sense that it sequesters carbon, aquifers refill, new soil is created through decomposition, forests grow, fish populations increase, to name just a few examples. Soil also erodes, trees die, animals succumb to predators and disease, but when the Earth keeps the regeneration and degeneration aspects in balance, there is sustainability. When humans come in and utilize resources as well, we must allow enough regeneration to keep that sustainability going, but we are failing, at the moment, to do so. It’s as though we are spending more out of our chequing account than is going in, and on August 13th, that account became empty and we’ve had to switch over to savings. Anyone who manages their personal finances would probably agree that’s not the best long-term plan. The Global Overshoot Day concept draws the analogy that that’s exactly what we are doing ecologically. Similar methods have been used by tax activists, in the form of ‘Tax Freedom Day’, the day in the year at which point an individual has earned enough income to pay off their income taxes. 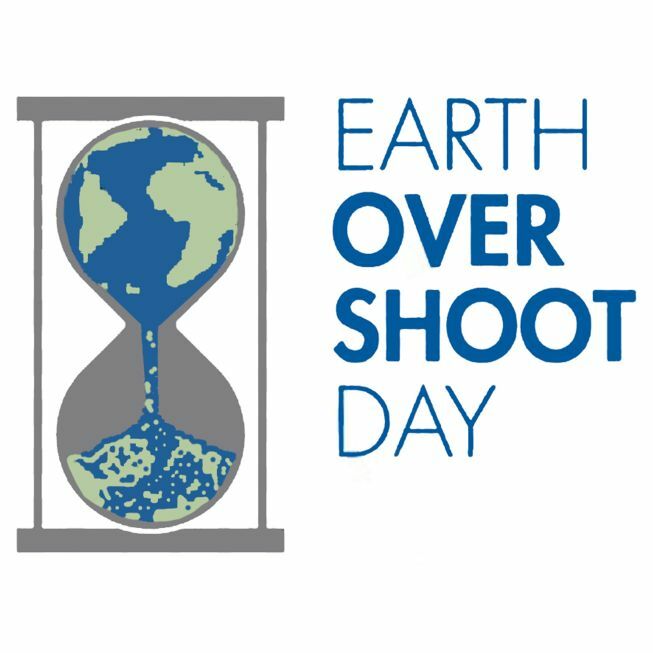 In terms of communication Global Overshoot Day has a few advantages as a concept. It gets across the message that the planet is not finite, and simplifies complex ecological concepts into a simple analogy. If one only reads the headline they risk thinking that the planet is like a store room or bank account that gets refilled every year, and the best way to get through to the next year is by better rationing, which is a message few respond to positively. They may also think that the concept is bunk because it doesn’t feel like this year’s resources are all used up: clearly there was no sudden shortage of anything on August 14th. The idea that we have store rooms or savings accounts for many years available to us, and we’re dipping into those ones now, rather than saving them for their assigned year, is a clearer way of conceptualizing the issue. The idea that we are borrowing from the future and spending or using up faster than we are regenerating is something that everyone can understand. Global Overshoot Day also works as a measure of sustainability. In 1970, Overshoot Day fell on December 23, and the date has steadily crept earlier and earlier up the annual calendar ever since, which is not surprising as both population and consumption have gone up, even as environmental awareness and sustainable practices are greater than ever. If we can get Global Overshoot Day to December 31st, or eliminate it altogether, we will, as a global society, be living within this planet’s limits. The next step in this concept, which may not be easily taken without some further messaging, is looking at resources as part of a cycle, rather than a use-up-and-refill relationship. This is why composting and food gardening are actually more powerful than they look. It gives people the chance to understand and interact with the cycle of decomposition and growth that feeds them. The idea that resources and everything we use being part of a cycle that includes both natural and technological aspects is not a widespread thought process. On the one hand, it may be tricky to get people to engage with such a concept, but on the other, it’s an idea that needs to start blowing some minds if we want faster progress on sustainability. In other words, start taking conceptual leaps, not baby steps. One disadvantage of the Global Overshoot Day idea is that it also tends towards big global thinking which can be scary and lead to an “I’m not the problem” or “what can I possibly do about it” response. Also the “I won’t do anything because I can’t be sure it’s worth the compromise unless I’m sure everyone is doing the same,” the classic tragedy of the commons response. To avoid this, groups looking to leverage this framing could tie resource reduction to increasing individual access to new systems and practices that will help them also improve their quality of life, have better access to things that make their lives easier, and reward them with community and belonging. For example, neighbourhood-wide yard sales, clothing swaps, tool and stuff libraries, or harvesting waste fruit from public trees and redistributing it. The emphasis should be on a better life with less clutter, less stress, saving money, more sharing, and a stronger sense of community, because those are things the vast majority of people already value. This entry was posted in Blogs on August 25, 2015 by Stephanie Ferguson.